Ever wondered why so many daisy-bright turmeric lattes are popping up on your Instagram feed? The answer is Ayurveda, an ancient art of ‘living wisely’ with roots in ancient India. Ayurveda encourages its followers to make choices in support of their dominant ‘dosha’, or constitution, which is either vata (wind), pitta (fire) or kapha (water). But could living la vida veda really hold the key to a balanced mind, body and soul? The Wellcome Collection, the London institute devoted to medicine and art, is staging an exhibition about Ayurveda, which runs until April 8. 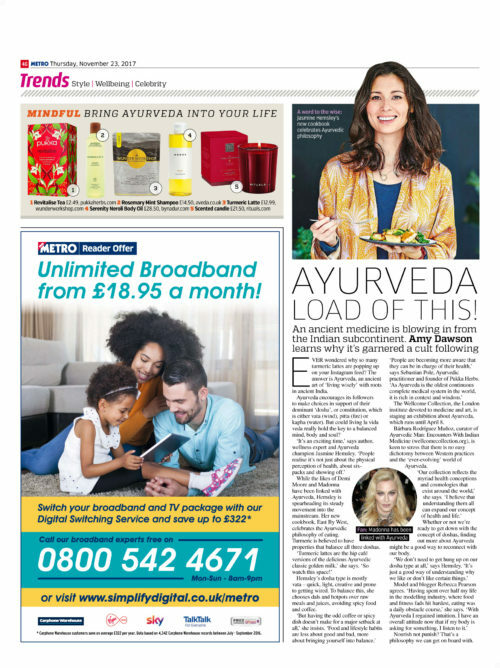 Bárbara Rodríguez Muñoz, curator of Ayurvedic Man: Encounters With Indian Medicine (wellcomecollection.org), is keen to stress that there is no easy dichotomy between Western practices and the ‘ever-evolving’ world of Ayurveda. Model and blogger Rebecca Pearson agrees. ‘Having spent over half my life in the modelling industry, where food and fitness fads hit hardest, eating was a daily obstacle course,’ she says. ‘With Ayurveda I regained intuition. I have an overall attitude now that if my body is asking for something, I listen to it.’ Nourish not punish? That’s a philosophy we can get on board with. All content copyright Amy Dawson 2019 unless otherwise stated.